"We would be mad not to use women's talents. In fact, it would be downright foolish," Cardinal Reinhard Marx, one of Pope Francis' top advisors, recently said at a mentoring program for women in his Munich archdiocese. One of Pope Francis' top advisors has called on the Western Church to admit a greater percentage of women to its upper echelons. 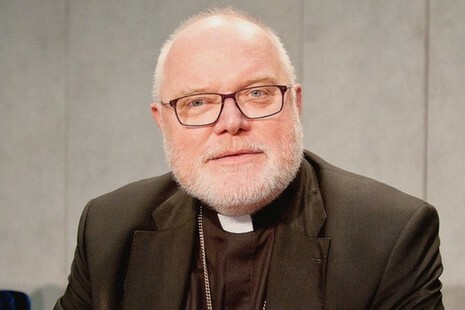 Cardinal Reinhard Marx of Munich, who is a member of the pope's Council of Cardinals (C9), made the appeal on June 22 at a mentoring program for women in his archdiocese. "We would be mad not to use women's talents. In fact, it would be downright foolish," he told participants at the gathering, which was sponsored by Hildegardis Association. The Catholic group was founded in 1907 to prepare women for academic positions in the Church. "We need a new image of what the Church is supposed to be - namely a world Church led by men and women from all cultures working together", said the cardinal, who is also chairman of the Vatican's Council for the Economy. He admitted that he had not always realized how important it was to have women in leading positions in the Church. For instance, when he was Bishop of Trier (2001-2007) he considered it "inconceivable" for a woman to have a leading position in the diocesan administration. But the cardinal pointed out that today eleven of Germany's 27 dioceses and five of Austria's ten dioceses have women in leading positions. "And there is satisfaction all round," he said. He said the fact that only men can be ordained as Catholic priests, is "certainly not helping the Church come across as a pioneer of equal rights". "But that does not mean only men rule the Church," the cardinal insisted. "That is precisely what the message must not be," he said. "And that is why I want to emphasize that positions of responsibility and executive positions in the Church that are open to lay people must be shared by both men and women," he added. Cardinal Marx said the Church must not only avoid giving the impressions that only men are in charge, but must also confront the fact that it has discriminated against women in the past. He said it's not for him to judge what is happening in other cultures. "But one thing is certain. Things (here) will not remain as they are," he predicted. When a survey undertaken by the Germany's bishops in 2013 showed that women were still under-represented in the upper echelons of the Catholic Church in the country, the Hildegardis Association promptly reacted. "Experience has shown that it is becoming increasingly difficult to find a larger number of qualified applications for executive jobs," the group said. "This is where our mentoring program, which has received several awards for its work, comes in," it added. The conference of Catholic bishops in Germany has given its support to the Hildegardis Association's ongoing mentoring program to increase the number of women in executive positions in the Church. Currently, fourteen of the country's 27 dioceses take part in it.